Daniel Wright (left) and Earl Brown in their West Oakland facility. It’s sweltering hot inside this nondescript warehouse building in West Oakland, and for the fifth or sixth time in the past twenty minutes, Daniel Wright hands me a glass tumbler full of freshly distilled brandy and asks me what I think. What I’m thinking about, really, is how to take as tiny a sip as possible so my throat doesn’t burn too badly, and I don’t have another coughing fit and lose face in front of this burly, thickly bearded tugboat-captain-turned-distiller-of-craft-spirits. Also, as the afternoon wears on: that this brandy doesn’t taste half bad. Later, I was told the liquor I took progressively tinier sips of had historic significance: It was what Wright and business partner Earl Brown believe to be the very first batch of brandy — or any craft spirit, for that matter — to be legally distilled in Oakland since the onset of Prohibition. 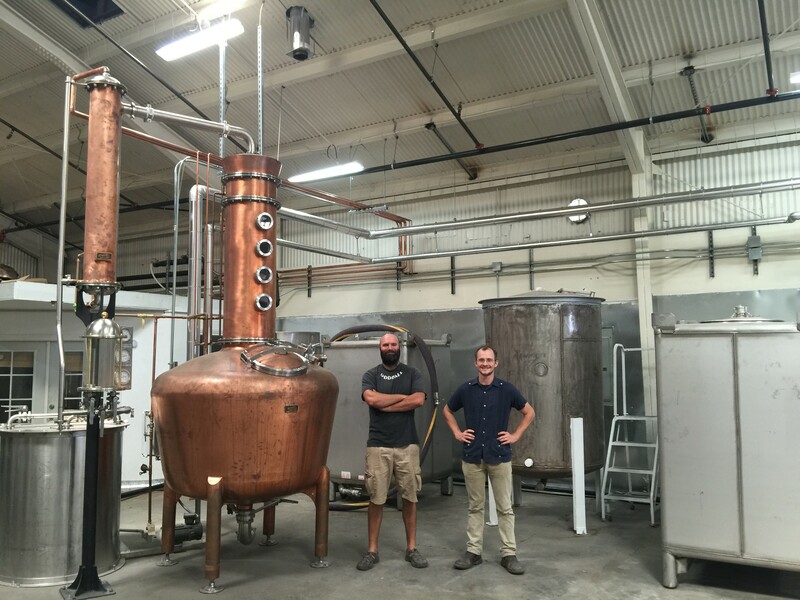 The two entrepreneurs are childhood friends who grew up in the same remote section of Humboldt County, and they’re the proprietors of Wright & Brown Distilling, a new distillery that they say is the first one to open in Oakland in nearly a century. Even though their still was producing brandy — a relatively low-risk product to make while Wright, the head distiller, is getting a feel for his equipment, because all that’s required is a supply of inexpensive wine — during my visit, their plan is to primarily manufacture whiskeys. 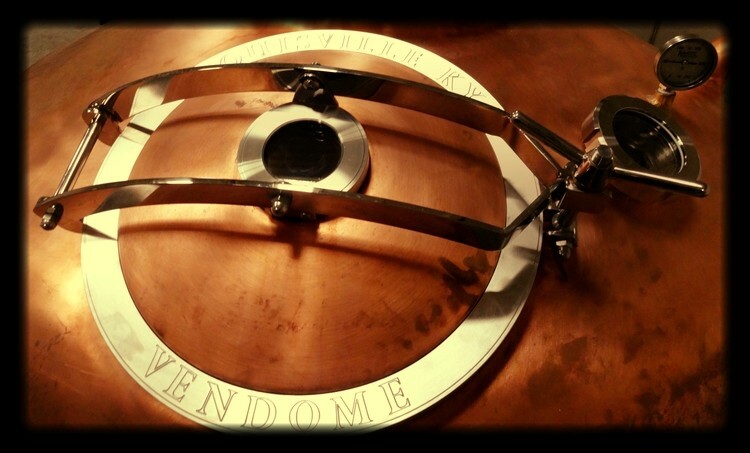 The centerpiece of their West Oakland facility is an old-fashioned copper still that was hand-built by Vendome, a one-hundred-plus-year-old company based in Louisville, Kentucky. It’s a gorgeous piece of machinery, all burnished metal, analog dials, and ancient-looking little portals, like some gadget out of a Jules Verne novel. And that’s fitting because Wright and Brown talk about wanting to produce craft spirits in a decidedly old-school way. Brown said he remembers a trip, years ago, when he and Wright visited the Jim Beam factory in Kentucky and saw the company’s 65-foot-tall still, with every possible variable monitored via computer screens in an air-conditioned control room. At Wright & Brown, distilling brandy or whiskey appears to be as much art as science. Wright can manipulate the temperature of the brandy he’s distilling, but ultimately, he said, his palate is his most important piece of equipment. Hence, the constant tasting and re-tasting of each batch. “When you make something good, it is art,” he said. According to Brown and Wright, the reason that Oakland has yet to develop a vibrant craft-distilling scene, despite a steady proliferation of craft breweries and boutique urban wineries, mostly has to do with the challenging regulatory environment throughout California. Generally speaking, it’s very difficult to even learn how to distill whiskey and other spirits in the United States, because, unlike with winemaking or beer brewing, it isn’t something that amateurs can experiment with, legally, in their garage or basement, unless they obtain the same kind of federal and state permits that a gigantic company like Jim Beam has. That’s a costly and time-consuming process — Brown said they waited about a year and a half — that basically makes it impossible for a hobbyist to dabble. What’s more, California’s strict restrictions on the sale of spirits set up a three-tier system that makes it difficult for a small-scale operator to profit. A company such as Wright & Brown has to go through a wholesale distributor, who then sells the product to restaurants and liquor stores, who, in turn, finally sell that bottle or shot of whiskey to the customer. A bill that Governor Jerry Brown signed into law in 2013 allows distilleries to sell small samples to customers onsite — a modest concession that Wright and Brown hope to take advantage of once they set up a licensed tasting room. But the ability to do direct sales of entire bottles, which would be the real game-changer, remains off-limits. Added to this is the fact that distilling spirits is the ultimate in “slow food,” with a barrel of craft whiskey typically needing to age at least three years — if not five or ten — before it becomes a viable product. “I always think of it as literally putting time in a bottle,” Wright said, describing the near-magical process by which a grain, fruit, or nut gets distilled down to its essence. That said, he expects that, by working in tiny batches, Wright & Brown will be able to start selling bottles of whiskey, brandy, and rum in as little as six months. But Brown believes that while they’ve tentatively laid claim on the title of “first,” there certainly will other distilleries coming to Oakland. Earlier this summer, the Uptown Oakland winery Two Mile Wines announced plans to launch a gin distillery, and Brown said that with the interest in locally produced craft foods and beverages higher than ever, it’s only a matter of time before even more distillers set up shop — regulatory challenges be damned. Barley from the Mattole Valley. Brown, for his part, already talks the talk of a slow food veteran. 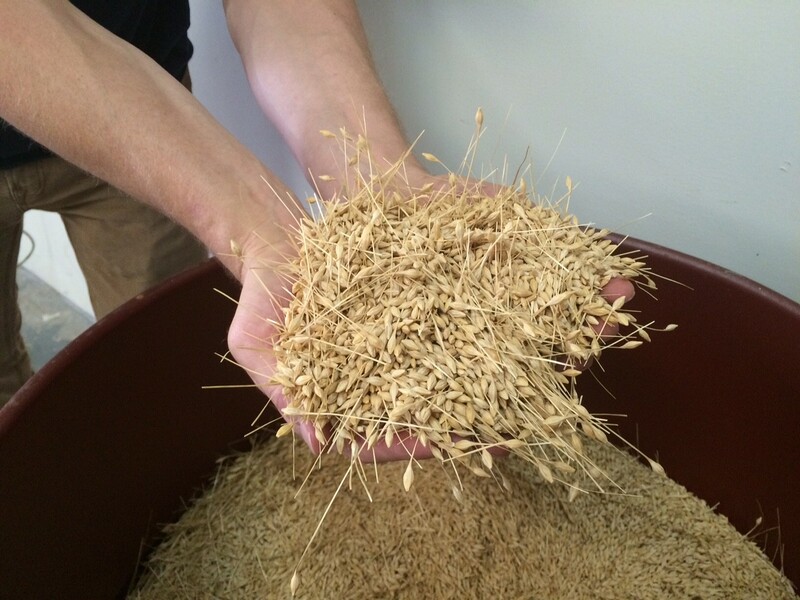 He said he’s buying barley from a farm in the Mattole Valley, in the same Northern California small town where he grew up, and wants to use it to create a single-malt, “single origin” whiskey — to use the nomenclature of the third-wave coffee movement. He also wants to work with local wineries to make special-label brandies that feature their respective wines. Walking me out, Brown gestured toward the surrounding neighborhood, with its vacant lots and barbed-wire fences, pointing out that this industrial stretch of West Oakland has increasingly become a kind of secret foodie neighborhood: Hodo Soy and OCHO Chocolate both have their manufacturing facilities nearby, and the folks at FuseBOX, the scrappy Korean restaurant down the street, are busy making dozens of varieties of kimchi at any given time. Like all of those enterprises, the Wright & Brown Distilling warehouse doesn’t look like much from the outside. But its proprietors are hoping that a year or so from now, Bay Area whiskey connoisseurs will be awfully glad they’re around.